There are many ways to add thread – this one is quick, easy and secure. When your thread gets down to about 6” (to estimate it, think of the length of a dollar bill), remove the needle and cut a new length of thread. Thread the old thread through the loop in the slip knot, placing the loop next to the bead, and tighten the slip knot around the old thread. You should hear and/or feel a distinct snap as the knot tightens. Tug on the threads to test the not and make sure it holds. Lightly wax the end of the thread with beeswax. If using Fireline, you can flatten the end of the thread using chain nose pliers. If you are right handed, hold the thread in your left hand between thumb and forefinger, and with your right hand bring the needle to the thread. Reverse for lefties. Watch our youtube video here: How to thread a beading needle! 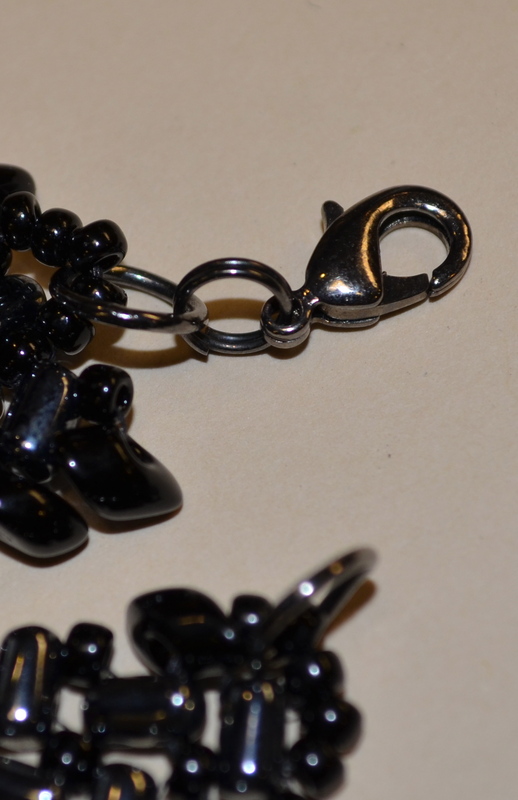 Clasps are a stress point in any beadwork. 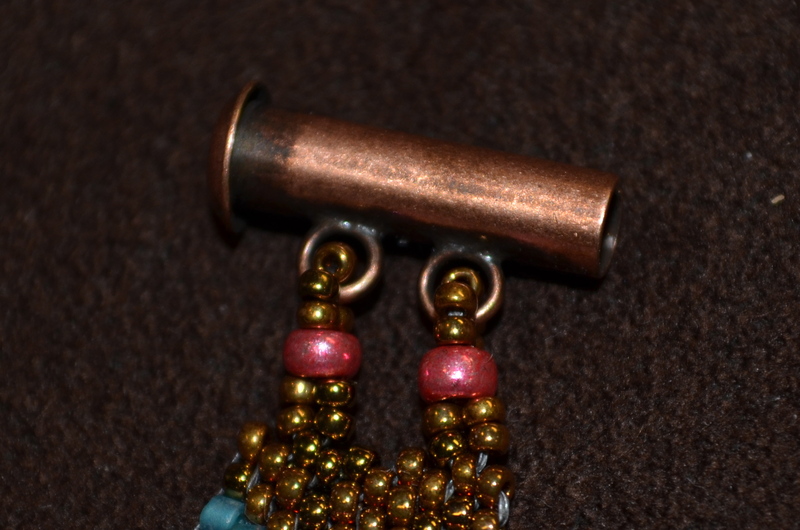 Always reinforce the stitches you use to attach a clasp – for me this means stitching through the beads at least three times. Inspect your clasp for sharp edges or burrs. Use a bead reamer or file if needed to smooth any rough spots. Protect your thread with beads whenever possible. Use soldered jump rings, oval jump rings or split rings (the ones that look like tiny key rings). 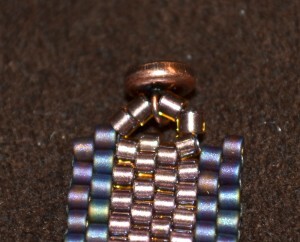 Avoid round jump rings – the thread can slip through the opening. Lobster Clasp, soldered jump ring and split ring attach. 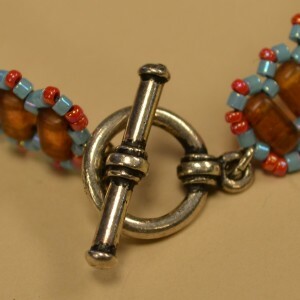 Stitch around a soldered jump ring, then attach a clasp of your choice using a split ring. Slide Clasp with embellished connection. 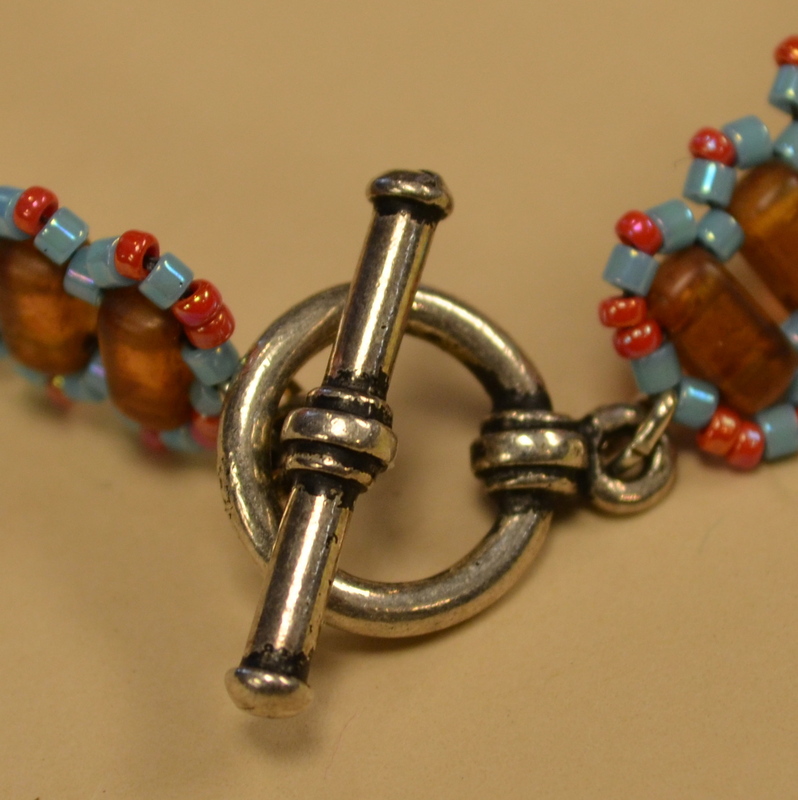 Example uses a Size 8 seed bead with Size 15s through the clasp, but a fire polish works well in place of the 8. 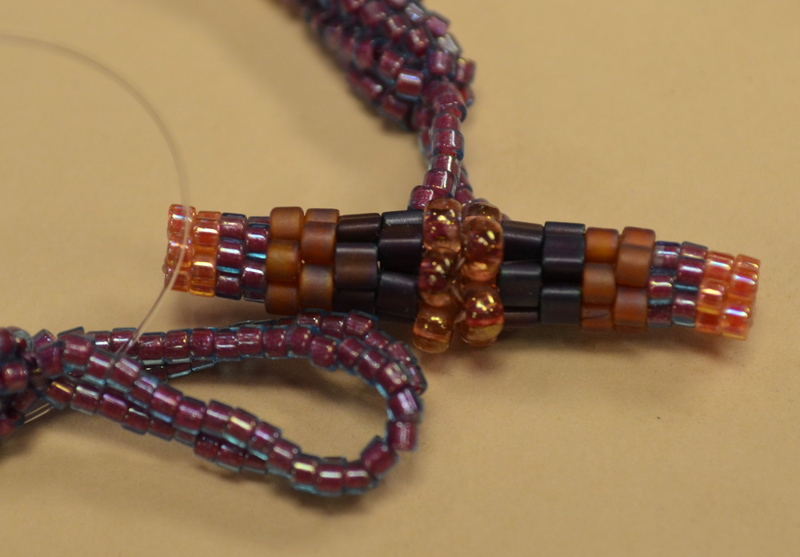 When you finish your beadwork, and when you need to get rid of the tails when you add new thread, you should always weave the tails into your beadwork to secure the ends of the thread. You don’t need to weave in the entire length of thread, just enough to keep it from coming undone. Pay careful attention to your thread tension – pulling too tight may distort the stitching you have already done. Stitch in different directions – up, down, around. Avoid a straight path, which will pull out easier. Thread: Common brands are Nymo, SoNo, KO, Fireline, C-Lon, One-G. These are all nylon thread and come in a variety of sizes and colors. Nymo in particular comes in sizes: 000, 00, 0, A, B, C, D, E, F, and G, with 000 being the thinnest and G being the thickest. (The most commonly used sizes in beading are B and D.) Fireline is a strong braided thread with no stretch and makes a good choice for sharp-edged beads like bugles or crystals, or anywhere you want a little more stiffness. Fireline comes in many sizes, and the most popular for seed bead stitching are 4lb, 6lb and 8lb. Through experience and trial and error, you will come to find your own favorite for each type of bead you work with and project you do. Waxes and conditioners both help prevent fraying in your thread. Synthetic and natural beeswax also protect and coat your thread as well as helping with your tension. Conditioners such as Thread Heaven, a Teflon-based product, makes your thread feel silky and will make it slide easily through the beads. Beading needles have a very narrow eye to allow for a bead to slide over it. The most common sizes of needles are 10, 12 and 13; the smaller the number, the larger the needle. Needles may start to curve over time from use and will need to be replaced. If you are making multiple passes through a bead or using different sizes of beads in your project, you may need to switch to a smaller needle while you work. 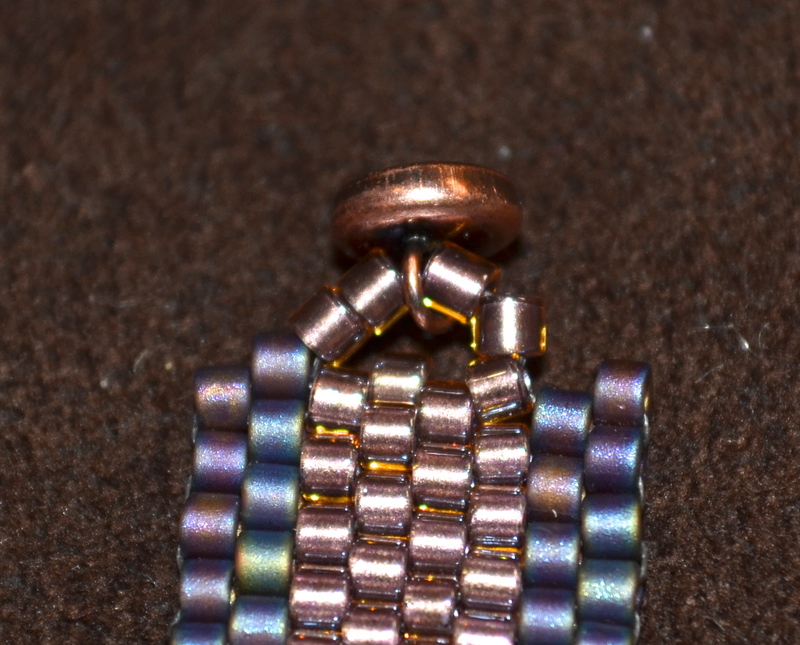 I always like to start beading with a 10 and switch to a 12 or 13 as needed. It’s good to have all three sizes on hand while you work. 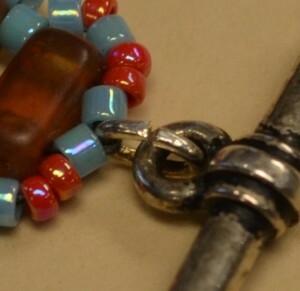 Seed beads are made of glass and sometimes have either linings or finishes on top of the glass. Seed beads are made in a variety of countries by a variety of manufacturers. There is little standardization; therefore, colors, sizes, and characteristics vary widely. Sizes range from 3° to 24°. The larger the number, the smaller the bead. Even these sizes vary from one maker to the next. You will find that an 11° Delica has a large hole and is a small bead compared to a different kind of Japanese 11° or a Czech 11°. It’s important to keep these differences in mind, and if you have a project with a specific supply list, any substitutions maybe require adjustments. Seed bead shapes range from triangles to cubes to donuts to hex. Currently there is a trend in multiple hole shapes and complicated shapes, and it seems like we learn about a new bead or more every month. We are selling and carrying more and more of these, and they are not going away! Some beads are faceted once (called Charlottes) or multiple times (called three-cut), giving them added sparkle. 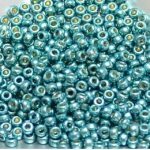 Finishes and colors are mostly permanent in quality beads, but be aware that dyed beads or metallic finishes may wear off under heavy use, and some may change color after prolonged exposure to UV light. Delicas have a wear chart available which shows colors requiring special care. Newer coatings such as Duracoat from Miyuki or Permanent Finish from Toho are a coating applied over the metallic finishes to enhance the wearability of the finish. To learn more about the beads and products you stitch with, stop in your local bead shop (in Knoxville, that’s White Fox Beads of course!) and have a conversation with the staff there. 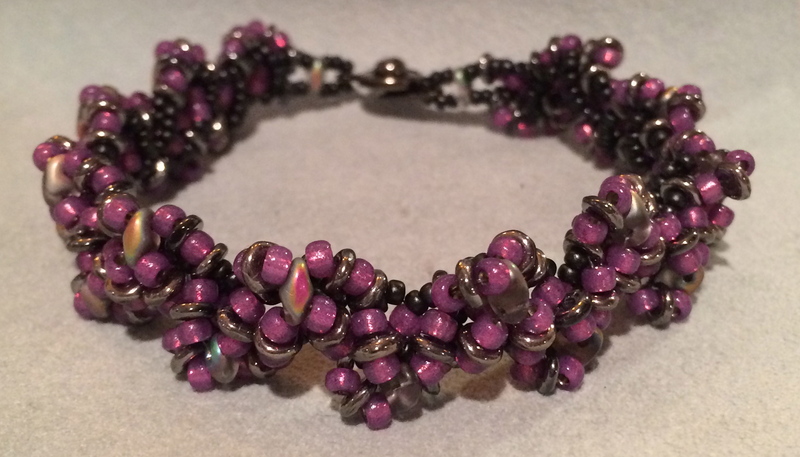 Ask questions, take classes and get out there and bead! The more you DO, the more you learn. Do you have any tips you would like to share? We’d love to hear about them in your comments! Now go bead something – I know I will!